How do you stop a SkiBike? ....By skidding sideways or turning uphill not by digging in your heels like Fred Flintstone. Is SkiBiking dangerous? ....No, if anything it is safer than other snow sports. Remember the first time you rode a bike? You were 8 years old and had got past the falling over, bloody knees stage. Yes? Now imagine that feeling keeping going as long as you are heading downhill. Think of powerslides without limits, drifting by as much, or as little, as you want. How do you get a SkiBike up the mountain? ....Chairlifts are the best method, the bike rides across your lap. Poma/button drags are possible but take a little practice. T-bars are the most awkward but can be utilised too. If you can ski, then wearing footskis, SnowBlades or skiboards will make access much easier. Where can you go? ....On or off piste, downhill, winter park or even cross-country, it all depends on the style of skibike. On piste, red and blue runs are ideal, some green runs can be a little too flat, some black runs can be too narrow. Off piste, riding through the trees is awesome. Half Pipes are a hoot and you can go round or over moguls and bumps. Freestyle jumps and snowpark terrain are all possible on a skibike. Is SkiBiking fast? ....It can be, the speed record is over 100mph, skibikes are efficient and accelerate much quicker than other sliding techniques. Is SkiBiking tiring? ....From personal experience I would say that it is 50% of the effort of skiing and 300% the fun. What is a "Pegger? "....These are the type of skibikes that you ride with your feet on foot pegs. They offer a much better ride if you want to do tricks in the snowpark, go through deeper snow or just look cool cruising around. They can be quite hard to ride at first, but once you have mastered the technique the rewards are worth it. 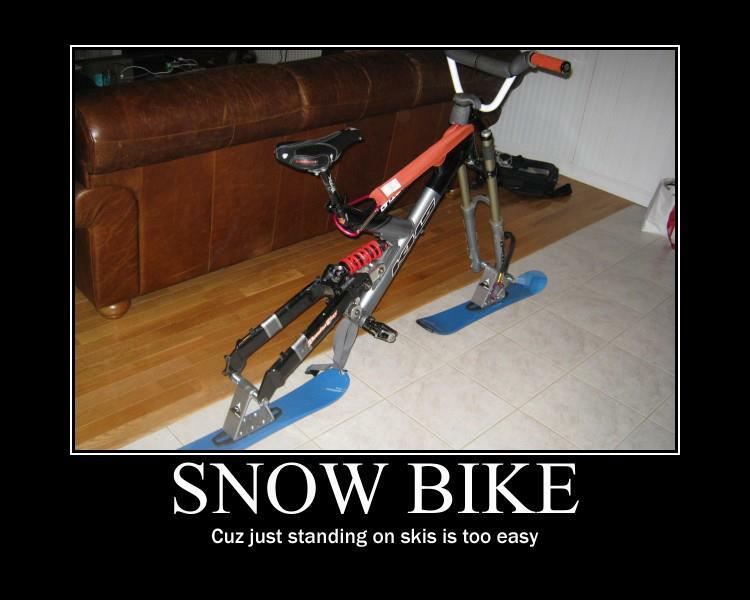 They are usually called "Freestyle Skibikes" nowadays and can be converted mountain bikes or purpose made skibikes. What is a Skibob? ....These are the type of skibikes in use from the 1950s onwards. You sit very low and ride with your feet on the snow gliding on tiny "foot skis". Because you have up to 4 points of contact with the snow and a low centre of gravity they offer tremendous stability. They are well suited to riders with mobility, balance or coordination problems and also for high speed racing, where speeds of over 70mph are achieved. What sort of person should try SkiBiking? ....if you know how to ride a bike and want to be having fun, not taking lessons, falling over, getting cold, wet, injured.... if you like BMX and want to do tricks and jumps.... if you want to ride your favourite mountain bike summer trails in the winter season.... if conventional winter sports are starting to become boring.... if you have damaged your knees/ankles/back doing other snow sports ... if you want to wear out your Grandchildren before they wear out you!